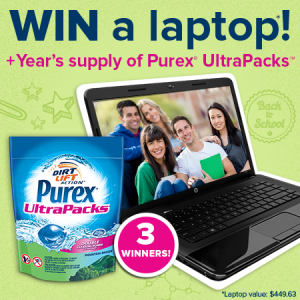 How To Enter: Entrants may participate by visiting http://www.purex.com/promotions/win-laptop-year-supply-ultrapacks-sweepstakes to complete the entry form as directed and clicking “Enter This Promotion” to receive one (1) entry into the sweepstakes. Timing: Entrants have until 3:00 PM PT on September 30th, 2014 to submit their entries to be entered into the sweepstakes. Limit: No more than one (1) entry per person, per e-mail address, per day, during the promotion period will be accepted. Eligibility: Entrants must be legal residents of the fifty (50) United States and District of Columbia, who are at least eighteen (18) years old at time of entry to be eligible to enter.